Urban planning, regeneration and design is an essentially cultural practice with the outcomes often depending upon an understanding of and engagement with the past. As cities in China strive to be competitive and attractive on the world stage, their decaying historical urban fabrics are being transformed into vibrant places through historical-cultural led urban regeneration, however, the impact of their rapid development has escaped serious scrutiny. Heritage-led Urban Regeneration in China presents the detailed evolution of three well-known historic streets in China: the Southern Song Imperial Street in Hangzhou; the residential Pingjiang Street in Suzhou; and the commercial Tunxi Old Street in Huangshan. From their original formation to their more recent regeneration, this book offers a critical evaluation of historical-cultural led urban regeneration projects in China and provides theoretical guidelines for contemporary practice in relation to its tangible and intangible urban heritage. Using interdisciplinary research in architecture, urban design, history and cultural studies, Jing Xie and Tim Heath provide a detailed analysis of the conservation and regeneration efforts of China as an emerging and pivotal world power. 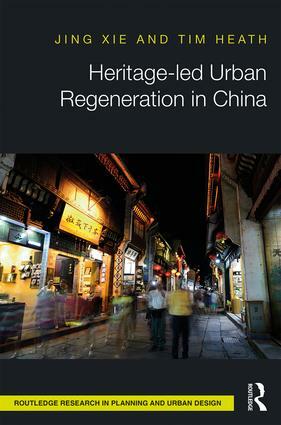 An invaluable resource for urban designers, urban planners and architects interested in and working in China, Heritage-led Urban Regeneration in China helps its readers to engage with the essential and invisible factors that produce these revitalised places while forming a critical view towards these projects. Jing Xie is Assistant Professor in Architecture and Urban Design at the University of Nottingham (Ningbo, China). Tim Heath is the Professor of Architecture and Urban Design at the University of Nottingham, UK.